Moderate, difficult in areas with rocky footing and hills, rest is fairly easy. Upon a knoll deep in the woods is where the states of Rhode Island, Massachusetts, and Connecticut meet. At that point is a granite marker. It is not an uncommon occurrence in the United States. But here it is all on public land and there are trails leading to it. Although this hike was not just to the marker and back, it certainly is one of the highlights of it. This hike would lead us through all three states using various trails. We (myself, Auntie Beak, and a another fellow hiker) started at East Thompson Road where the Airline Trail crosses the road. This would be the first highlight of the hike. At this location on December 4, 1891 the Great East Thompson Train Wreck occurred. It was the only four train collision in the countries history. There is signage here explaining the event. From here we headed east along the Airline Trail. The trail itself is the former railroad bed. It is now just a flat wide dirt and gravel path. We soon came to an old wooden bridge that crossed the path. The bridge was apparently used to herd livestock safely over the railroad. Just after the bridge and to the left is a faint path that leads toward the bridge approach. Here is the next highlight of this hike. It is the Hermit Cave. The small hole in the side of the hill is the entrance to the cave. Inside the cave (flashlight required) is some impressive stonework. No one knows for sure who built it, but it appears to be similar to many root cellars found throughout New England. Continuing on the Airline Trail we soon came to a sign for the blue-blazed Tri State Marker Trail. Here we turned right and started the fairly short (three tenths of a mile) but relatively challenging uphill and rocky climb toward the next highlight of this hike. This trail follows the Connecticut/Massachusetts border. 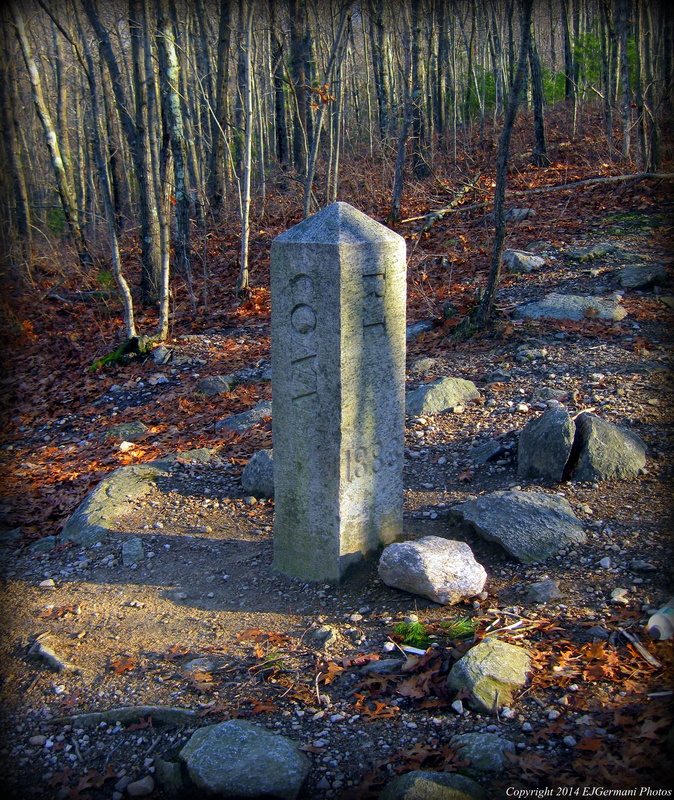 At the top of the trail is a small clearing with a large granite marker. This is the Tri-State marker. The monument, dated 1883, has the abbreviations of the three states inscribed in it. The trail to the right would lead you back to the Airline Trail if you decide you have seen enough. 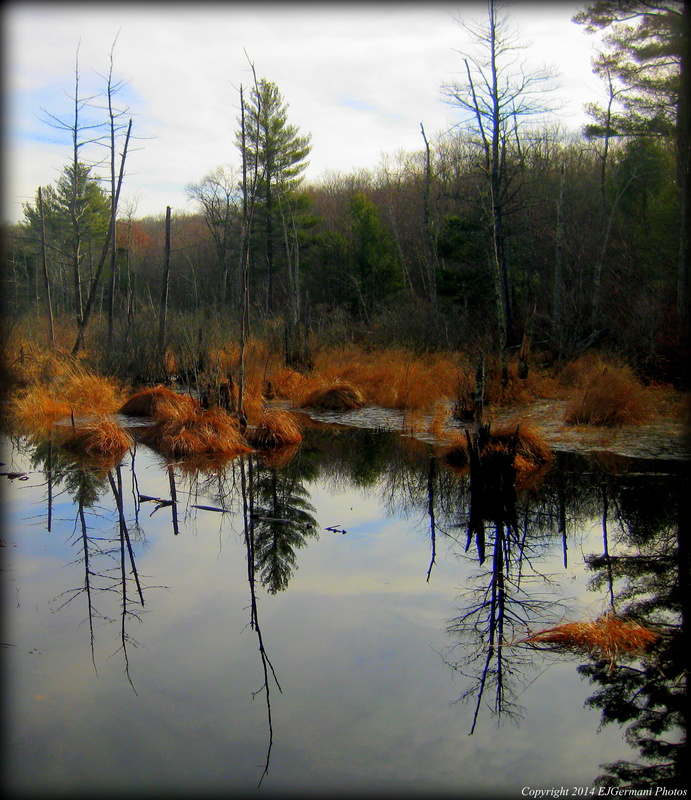 The trail straight ahead, called the Border Trail by locals, would lead you along the Connecticut/Rhode Island border into the heart of the Buck Hill Management area. We opted to follow the trail to the left (east) that follows the Rhode Island/Massachusetts border. We were in the extreme northern edge of Buck Hill along this trail. The trail, still rocky and somewhat difficult, continues to climb uphill, passing a few more state boundary markers along the way. The trail soon ends. We turned left onto the next trail and into the Douglas State Forest. The trail, unblazed and unnamed steadily descends down the opposite side of the hill we just climbed over. The hike from here on is relatively easy as most of the inclines were now behind us. Along this trail we came across the first of some quite impressive cellar holes. At the next intersection we turned left onto the yellow blazed Mid-State Trail. We followed the Mid-State for a while passing yet another impressive cellar hole. The Mid-State then turns to the right (sign on tree says “PARK”), we followed the trail to the left and continued downhill, passing a small stream, to a four way intersection at the Southern New England Trunkline Trail. This trail is a continuation of the railroad bed we came in on. It just has a different name on the Massachusetts side. Before turning left and following the trail back to the car, we did a little exploring to the right and straight ahead checking out some of the water features. Rocky Brook offers some small cascading waterfalls and the pond here was still with some nice reflections. 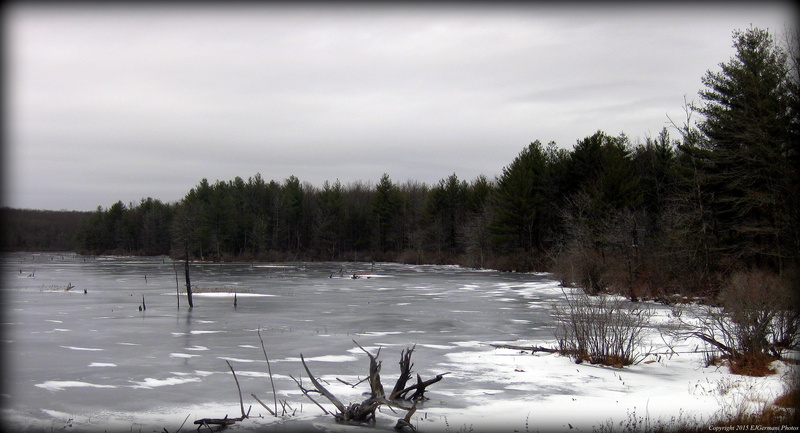 Both Buck Hill in Rhode Island and the Douglas State Forest in Massachusetts are open to hunting. We did come across hunters on this hike. Be sure to wear blaze orange during hunting season.